The concept of the "public intellectual" has a rich and colorful history. It began in the early twentieth century, when the new mass media catapulted intellectuals who were able to write for the general public to semi-stardom. The first wave included figures like Walter Lippmann-who coined the term "stereotype" and is widely considered the founder of media studies-and by the 1950s, public intellectuals as a species had become a powerful and influential force in theAmerican cultural landscape. By the 1970s, the standard definition of the public intellectual had solidified: a person (often university-affiliated, but not always) able to discuss and dispute any serious issue, typically in venues like The New York Review of Books, and occasionally influencepolitics. 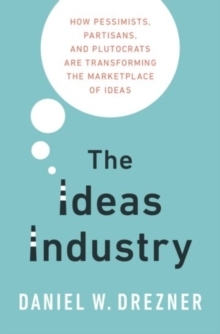 The traditional definition of the public intellectual remains with us, but as Daniel W.
Drezner shows in The Ideas Industry, it has been gradually supplanted by a new model in recent years: the "thought leader." In contrast to public intellectuals, thought leaders gain fame as purveyors of a single big idea. Also, instead of battling it out with intellectual combatants in the pages of The Partisan Review, The Public Interest, and their descendants, they often workthrough institutions that are closed to the public and which release information selectively. Thought leaders and their associated ideas tend to become brands-hedgehogs to the public intellectual fox. They have also proven to be quite successful, as evidenced by TED, Aspen Ideas, the Clinton Global Initiative, and the like. Furthermore, they often align with one side of a politically polarized debate and enjoy the support of ideologically friendly private funders. Drezner identifies increasing inequality as a prime mover of this shift, contending that our present-day class of plutocrats not only wants to go back to school, it wants to force "schools"-in the form of intellectuals with elite affiliations-to come to them. And they have the money to make this happen. Drezner, however, does not see the phenomenon asnecessarily negative. While there are certainly some downsides to the contemporary ideas industry, he argues that it is very good at broadcasting intellectual content widely and reaching large audiences of people hungry for new thinking. Both fair-minded and trenchant, The Ideas Industry will reshapeour understanding of contemporary public intellectual life in America and the West.